Hooray, England are out of the world cup. Well, not really hooray, as I love a bit of football, love supporting England and was really looking forward to it, like many of us. But now we’re out, and in such spectacularly disappointing style, the press are full swing into the autopsy and it’s been interesting to compare and contrast the achievements of our men to that of our women’s team. Yesterday those achievements were celebrated at the 12th FA Women’s Football Awards. 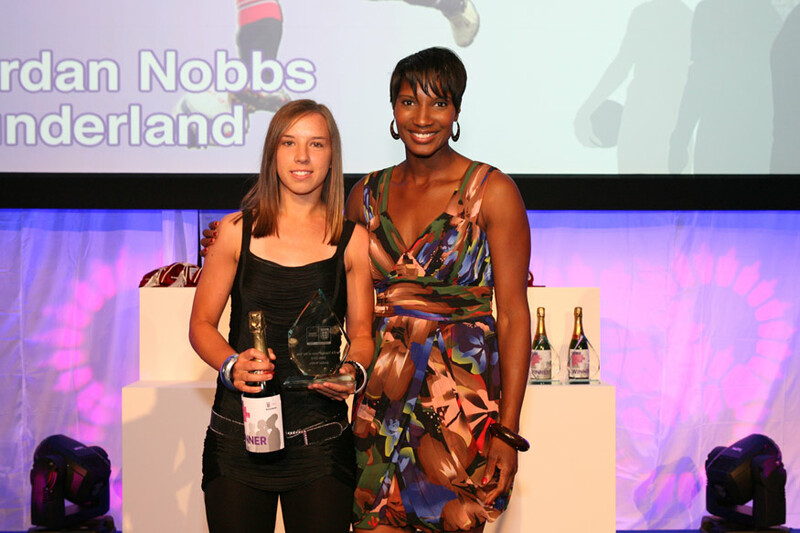 Kim Little received most honours for being top goal scorer as well as many others including Natasha Dowie, Katie Chapman and Jordan Nobbs (seen below) who was young player of the year. We’d like to add our congratulations to these women and to shout from the roof-tops about their successes as well as to the inspirational Hope Powell, Lewisham born, for receiving her CBE in this years Queen’s honours list. 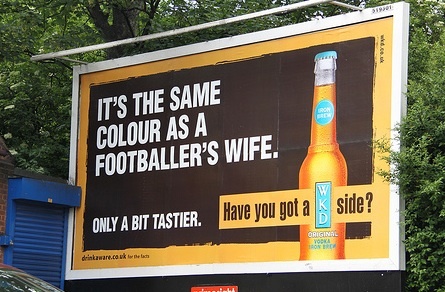 So great to have so many role models for our girls to aspire to be… a bit more of this and a little less of the ‘Future WAG’ or ‘WAG in training’ t.shirts wouldn’t go amiss, how about Future Football Manager, or Future Young player of the year instead? Well, I do dare, because the plain fact of the matter is, is that whilst we’re busily being told how stupid we all are in the ads… Sport England’s Active People survey in 2008 tells us that 260,000 women and 1.1 million girls play some form of football in England and that there are 26 million females playing across the world, of which 4.1 million are playing affiliated football – this is a 54% growth since the year 2000 (FIFA Big Count 2006) and I’d wager that those numbers have risen since then too. 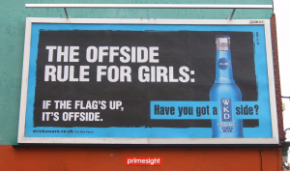 I’d focus on reminding our ‘lads’ where the back of the net was first…. no? My niece is doing amazing things. At the vulnerable age of seven she is making her very own stand against the pinked up tyranny that surrounds her. She doesn’t like pink anymore. Hallelujah I cry. Not only that but she would like to wear shorts rather than that school dress please. Good choice! Much better for climbing. She’s also taken the brave decision to wear her football kit of choice as she proudly takes part in the inevitably boy-dominated football sessions after school. All the braver because her football kit of choice is Tottenham Hotspur’s. The boys in their mass marketed Chelsea and Man Utd uniforms think this is funny – but she can handle that. What she finds much harder to cope with is the horrible stick she gets from the girls; ‘you look like a boy’, ‘that’s what boys’ wear’ ‘do you want to be a boy?’. It’s so familiar to me. It’s as if 30 years of my life never happened. In 1979 I was in exactly the same place. The kit was red with white sleeves but the bullying was just the same. On the face of it that is quite depressing. However if you look closer there is room for a smile. There will always be spirits that can not be fenced in. No force in the world would ever stop me playing football (and many have tried). But women and girls all over the world play football in far tougher circumstances than I or my niece have ever faced. I sent this article to her as a reminder of that. And here’s another great piece of film. However, we need a prevailing culture that means you don’t have to be brave or tough to have the same choices as boys. Naturally cultural change is complex and multi-faceted but role models are essential. That is why it is absolutely critical that the Football Association get women’s football right. They govern the game in England, where the game was invented. They have responsibility for the development of the game at all levels and ultimately they have the ability to allow women and girls’ football to thrive – or in the current climate at least survive. Arsenal Football Club have for over ten years set the inspirational standard of what women and girls’ football could look like. The players are heroes. My two year old girl can shout their names and if I ever need reminding of how far we have come, I just take my daughters and their friends to join the crowd that every Sunday watch Arsenal women play. This year they won the FA Cup and League again. However, they really are the exception that proves what the norm could be. Thirty years on from my experience as a girl daring to be different the links are still missing. When girls on the one hand can dream of growing up to be Rachel Yankey, but still face bullying for just wanting to join in with the boys (or hopefully other girls playing football) we still have a long way to go. If you’re a football fan ask your club what they are doing for women and girls’ football (pink scarves in the club shop is not the right answer!) or remind the FA how critical it is for them to invest in the women’s game. Not every girl or indeed boy will get their kicks from chasing a football around a park. However, that should be their choice and no one else’s.